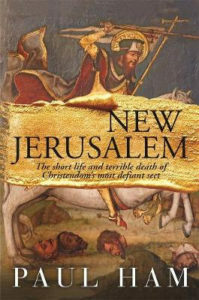 New Jerusalem is a non-fiction book covering the history of a militant and apocalyptic breakaway Christian sect in the early Reformation. The Melchiorites, named after their founding preacher, were early Anabaptists. A radical offshoot of Lutheranism, the Anabaptists were viewed as heretics by mainstream Catholics and suffered significant persecution. The Melchiorites sought sanctuary in the Lutheran-friendly city of a Munster. A small group of influential men put out a call for the poor to come to Munster for rebaptism as Melchiorites. More appealingly, they also promised that all wealth would be shared equally amongst believers. The subsequent flood of new converts meant that the Melchiorite leaders were able to gain power by election and then seize the city as a free state of its own, renamed New Jerusalem. The leaders then shut the city gates to ensure their followers can worship freely while they await the apocalypse, which they believed will occur next Easter. Once New Jerusalem has sealed itself inside Munster’s walls, its fate is a forgone conclusion. The secular and religious powers of the region made several attempts to take the city by force, before settling on starving the population out. New Jerusalem itself deteriorates rapidly in a cycle of events that are depressingly familiar to anyone who’s read about cults or totalitarian states. The people genuinely pool their wealth, but the richest aren’t willing to part with their privileges even before starvation sets in. Multiple prophets arise, but their prophecies all involve increasing their individual power and influence. The 16th century version of free love appears, and ends with powerful men taking multiple young wives and sexual violence against women on a large scale. And the prophesised apocalypse repeatedly fails to materialise. A fascinating story about a period of history I knew very little about. Breaking my lurking habit by enabling my reading habit. The right butter. The wrong butter. The tea of allegiance. The tea of betrayal.